With the cold weather finally closing in, it's time to make sure your pond is ready for the cold winter months to come. 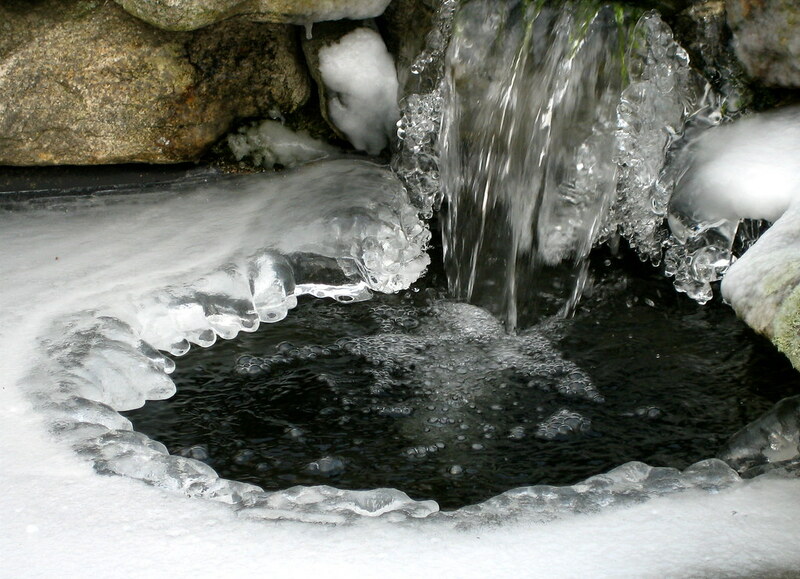 With the cold weather finally closing in it's time to make sure your pond is ready for the cold winter months to come. The pond will have naturally been winding down as the temperature has dropped, fish metabolisms slow down as well as plant life dying back. While not a particularly fun or inspiring time for a pond keeper the winter is an essential time of the year in which to prepare for the more enjoyable time in the spring and summer. By now you should have certainly switched to using Winter Wheatgerm Fish Food. This should be used once water temperatures go below 10-12 °C, and should be used until the temperature is < 7°C. This is the temperature at which fish naturally stop eating and start to shut their body down in a form of hibernation and go down into the deeper parts of the pond where the temperature remains most constant. For this reason it is also a good idea at the very least to remove the pump from the very bottom of the pond and slow down its flow rate. Some pond keepers will also completely remove the pump from the water over the winter and use it as a time to carry out routine maintenance. This avoids circulating the cold water from the surface with the warmer water in the depths. The final problem facing fish ponds in the winter is the threat of completely icing over, which would prevent the absorption of oxygen into the water, and trap CO2. To avoid this, solutions vary widely from expensive pond heaters to floating something on the surface to prevent the ice forming completely over the water. This is by no means a set science with many people reporting different successes with varying solutions. With the plant life dying back, this is the best chance you'll have of clearing the pond of any debris and performing a general cosmetic tidy up. It is particularly important to make sure you remove any dead organic material from the pond as this can slowly affect the water quality and chemical balance as the matter decays into sludge. This can cause an increase in nitrate levels which will give you problems with blanketweed and green water come the spring. Some pond-keepers take this opportunity to perform a partial water change, but it is important not change all the water, and to ensure any new water is treated with de-chlorinator if taken straight from the tap. Any frost sensitive plants should have already been removed and placed in a safe place to winter, with hardy water lilies being placed in the deeper parts of the pond. Along with protecting the plants, it can also be the time to prune and transplant many of the plants as they are dormant and will suffer less from the trauma. Think about adding a cover net to the pond especially if you have fish as without the plant coverage and in their dormant state they become an easier target for predators. The net will also help to keep out leaf debris. The removal of the pump shouldn't have an impact on the filtration as at about 10°C and below the bacteria in the filter will also become less active, as well as there being less waste from the fish and little chance of green water. Therefore, with no real need to filter the pond, it is a good chance to remove the pump, clean and re-grease (depending on manufacturer's instructions), and store along with the UV clarifier and filter (which you have drained and cleaned out), in a dry place safe from any freeze damage until it is needed again in the spring.